Indeed, one of the most perplexing problems facing a would-be waver is what to do when driving next to a fellow Corvette owner. Passing him going in the opposite direction is one thing. Greetings are exchanged, and that's that. But what happens when you pull up next to a guy at a light, wave, nod, smile and then pull next to him at the next light, a block later. Wave again? Nod bashfully? Grin self-consciously? Ignore him? Or take the chicken's way out and turn down the next side street? If you're expecting an answer, you won't find it here. Sad to say, some questions don't have any answers. 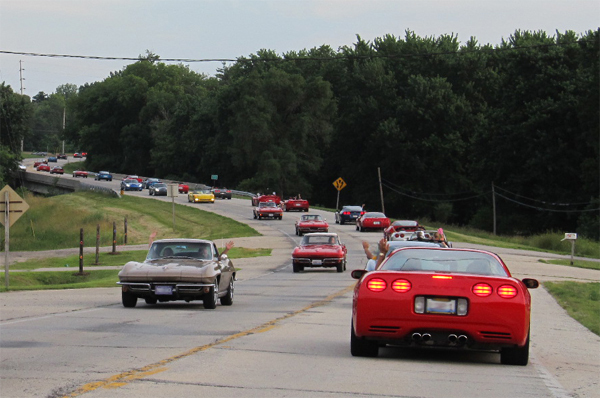 Girl-type Corvette drivers also have a unique problem: to wave or not to wave. The miss or misses who borrows her man's Corvette for the first time is immediately faced with this quandary. Should she wave first and look overly friendly, or ignore the wave and look like a snob? Most ladies who drive their own Corvettes prefer to suffer the latter rather than take a chance of being misread. For this reason, all girls are excused for occasionally failing to return a well-meaning wave. So are new owners who are still learning the ropes. There is no excuse, however, for a guy who refuses to return a wave, not out of ignorance, but of arrogance or apathy. While this type of behavior is the exception to the rule, it seems a few owners of newer models (remember this article was written in 1969) refuse to recognize anything older than theirs, while some others simply won't wave, period. Boo on them. These ding-a-lings don't seem to realize that they are helping to squash a tradition that had its beginnings back when most of us were still driving tootsie toys. You now know the meaning of "Save the Wave." This article first appeared in the August/September 1969 issue of Corvette News. The article was entitled "Save The Wave."